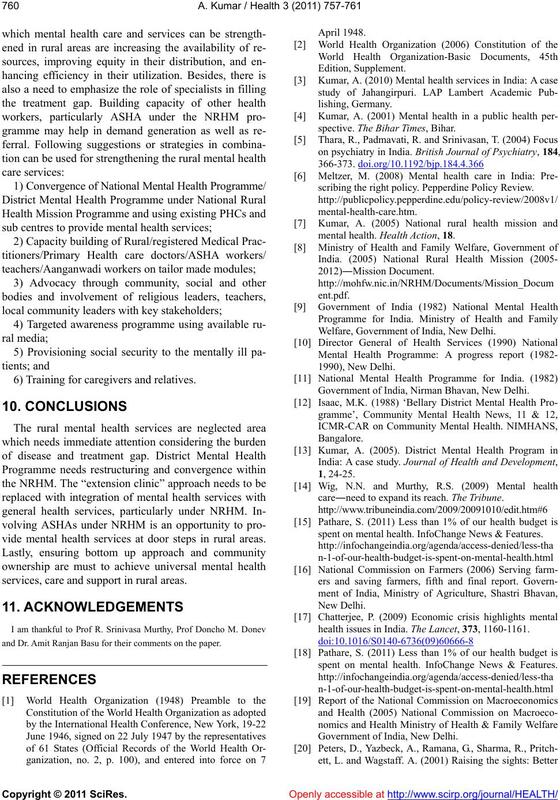 Received 18 August 2011; revised 11 October 2011; accepted 10 November 2011.
to provide mental health services in rural areas. model to reduce the trea tment gap. behavioural disorder would be higher in rural areas . mated ‘treatment gap’ of ninety percent. state governments and unclear plan of action and policy. of the country which often lacks public health skills. is resistance by psychiatrists to accept others as leaders. Table 1. Professional per 100,000 populations. Health Atlas, 2005. World Health Organization. Table 2. Psychiatric beds per 10,000 populations. mental health and have done commendable job . where the staffs lack professional training and skills. sidering the need and treatment gap. cial Health Activists (ASHA) is another opportunity. and every individual in rural areas. Table 3. 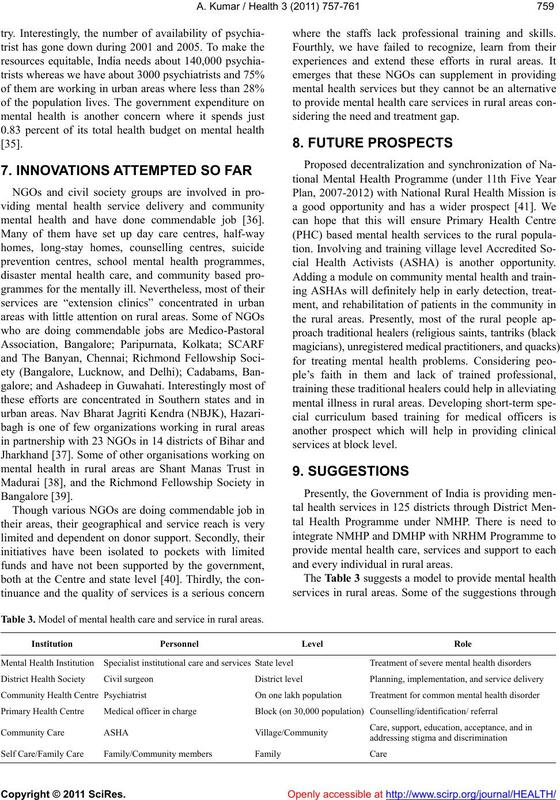 Model of mental health care and service in rural areas. 6) Training for caregivers and relatives. 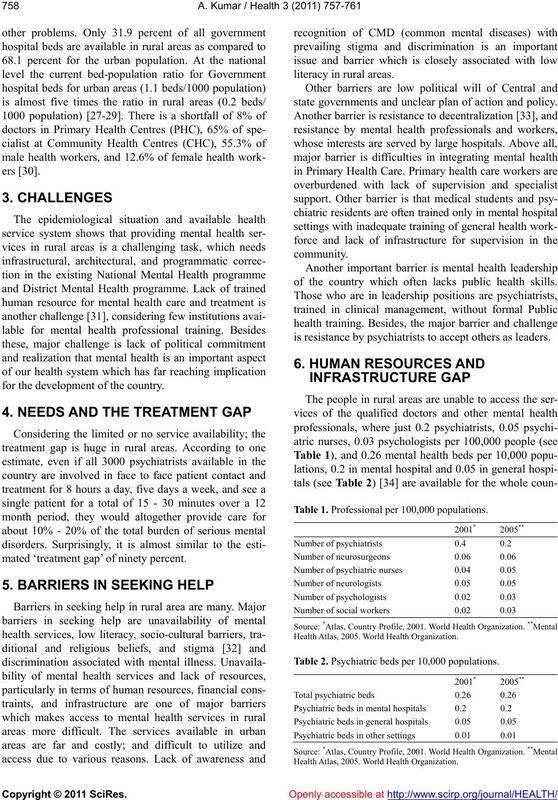 vide mental health services at door steps in rural areas. services, care and support in rural areas. and Dr. Amit Ranjan Basu for their comments on the paper. spective. The Bihar Times, Bihar. scribing the right policy. Pepperdine Policy Review. mental health. Health Action, 18. Welfare, Government of India, New Delhi. Government of India, Nirman Bhavan, New Delhi. care―need to expand its reach. T he Tribune. spent on mental health. InfoChange News & Features. health issues in India. The Lancet, 373, 1160-1161. 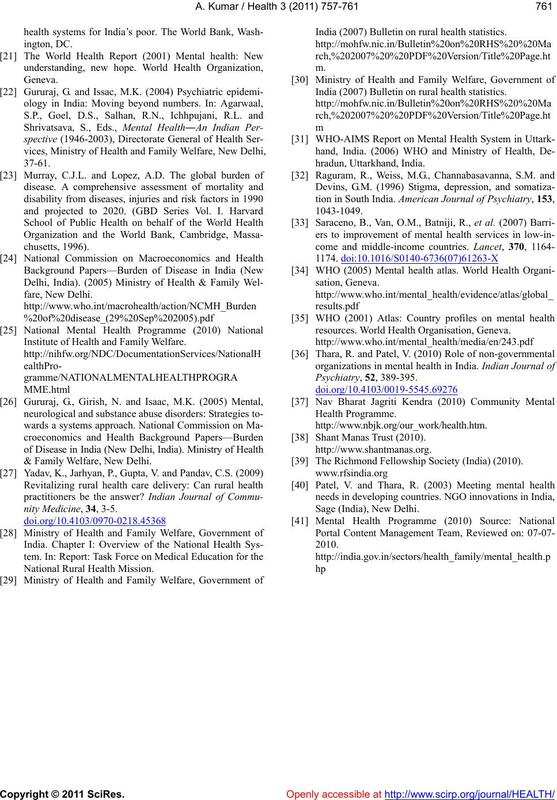 Institute of Health and Family Welfare. & Family Welfare, New Delhi. 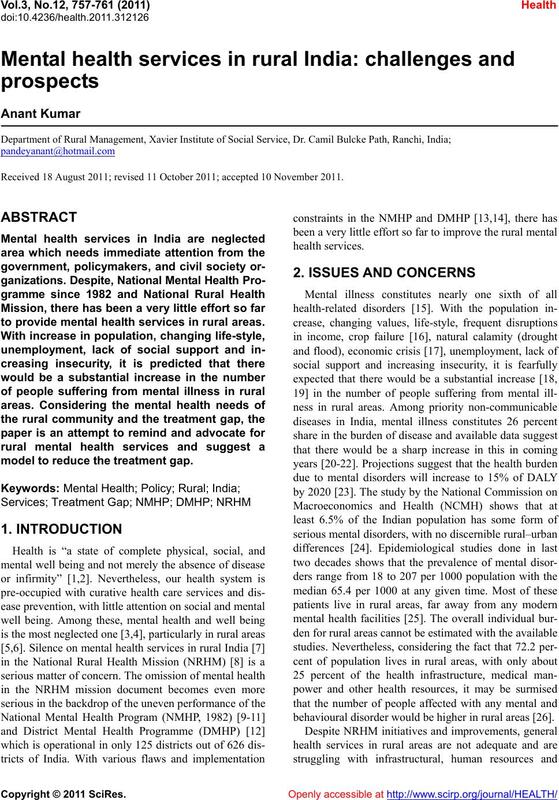 India (2007) Bulletin on rural health statistics. resources. World Health Organisation, Geneva. The Richmond Fellowship Society (India) (2010).